Best Espresso Machine under $500: Which One Should You Get? Shopping for an espresso machine isn’t an easy task. Here I’ll give you my list of solid machines under 500 dollars. 500 dollars seem to be where the invisible line is drawn, so if that is your budget, I congratulate you. 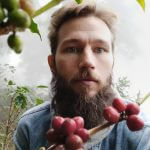 At this point, you should have some expectations, especially when it comes to materials and construction, but also in terms of coffee quality. The Gaggia Classic has the all the charm and finesse of an old-school Italian café. It’s beautiful in its own slightly ‘art deco’ kind of way, but most importantly it makes a damn good espresso shot. This could be a reliable home espresso maker for many years to come. While the market for espresso gear is vast today, the market can still mostly be broken down into three primary schools. My suggestion is that you more or less forget about the third category. You can find decent super automatic machines today, but they tend to be a lot more expensive than the semi-automatics. This is because everything is built into a super automatic – hence its other name; the fully automatic. With the press of a single button, you can get a cappuccino. With the semi, you will have to do the following every time you want a cuppa joe. In the end, the result is the similar, but the process is 100 percent different. That’s why semis and supers are likely to appeal to two different subsets of coffee geeks. 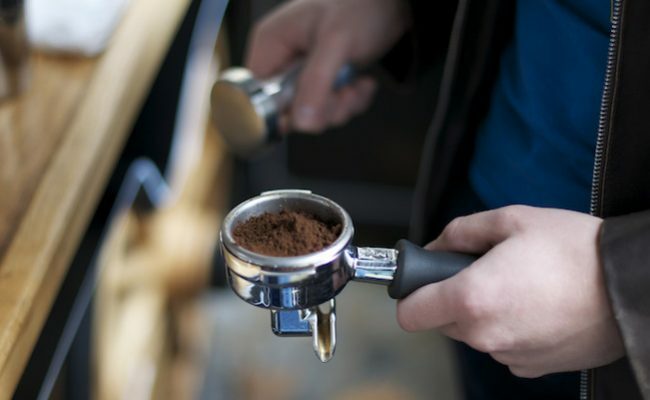 If you are a real coffee snob, ahem, lover, you’ll pick the semi because you are much more involved in the process, and you’ll be able to tweak the shot to please your taste buds. Okay, so by now we agree that the semi is the way to go. But the market is still huge. Luckily, you can always go the direction of the ‘classic.’ Some machines have been around for decades, which is a long time in today’s hectic consumer environment. What this means, is that customer complaints have been minimal and that no R&D department has been able to come up with severe improvements for years. Machines like Rancilio Silvia and Gaggia Classic are evergreens for a good reason. They are built like tanks, sturdy and get the job done. So it’s all pretty easy, right? Well, it would have been, if the espresso market hadn’t been shaken up by a specific Australian company within recent years. 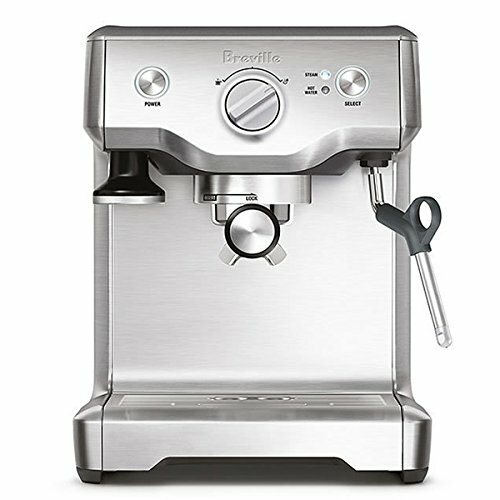 Breville has gained a reputation for creating solid espresso gear that incorporates new technology like PID temperature control at an attractive price. You could see the choice this way: Would you instead want a new, Japanese car with automatic gear and Bluetooth connectivity or a solidly built Mercedes? On the surface, this device looks like your regular, classic semi-automatic. But looks can be deceiving. In fact, this budget model from Breville packs in a bunch of exciting technology in this home espresso maker without taking away the fun that hands-on brewing is. You’ve got the cutting edge PID temperature technology that allows for pulling consistent shots every time. At the same time, there’s a unique pre-infusion function that slowly increases the pressure. All in all, this is probably the most advanced machine in this particular price range. Are you not that impressed with all the new and fancy technology? Do you love solid brass metal and detest flimsy plastic? Do you secretly think everything was better in the 90’s? 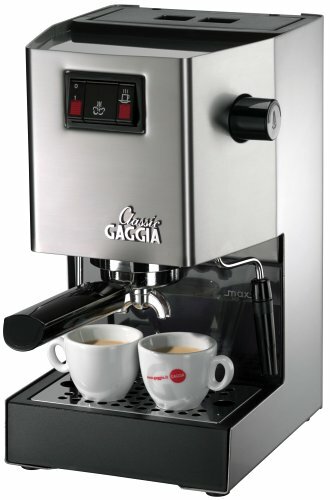 Then look no further than the Gaggia Classic. The design hasn’t changed since 1991. Either that means that the company is complacent or it means that they got it right back then. Judging from the reviews from serious coffee lovers it’s the latter case. 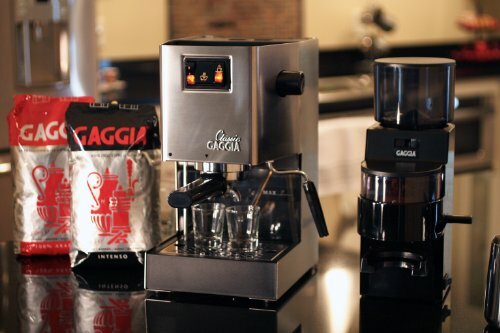 The Gaggia Classic lives up to its name: It’s a true classic. This machine is probably the smallest and cheapest espresso machine that can still be said to be an ‘authentic’ model. This is because it has a commercial 58 mm portafilter made from chrome-plated brass. If you want to make espressos the real Italian way, while still being on a budget, this is the way to go. This is the big brother of the Duo Temp Pro machine. It’s got all the same features, but then there’s a special volumetric and programmable mode, which means that you can override factory settings, and get it to brew the amount of espresso you desire. It’s named after its ‘pre-infusion’ mode that first wets the ground without brewing. After that a perfect 15 bar pressure is applied. Breville is generous when it comes to the technology, and they have equipped this little fella with a real PID thermometer, so the shot is always brewed at the right temperature. Another cool feature is that it has a ‘dry puck’ mode. In daily use that means that it’s easy to bang out the used grounds of the portafilter, and you won’t have to get your hands and sink all messy. This machine is BPA free, which is a nice plus. I’m not a fan of Nespresso machines. They are just a bit too boring and removed from and the traditional barista craft. But I know some of my readers are either too busy or too lazy to deal with the unavoidable hassle of true coffee geekdom. To you – and only you – I’ll have to admit that there are some severe pros to going the capsule way. 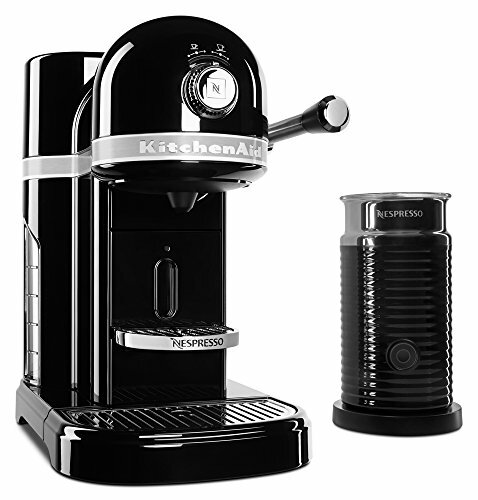 This model is one of the most advanced Nespresso machines out there, and it comes bundled with a milk steamer so that you can make cappuccinos and lattes as well. The KitchenAid espresso machine is not made out of flimsy plastic like most of the other capsule machines. Instead, it’s crafted out of solid metal and looks premium on the counter. 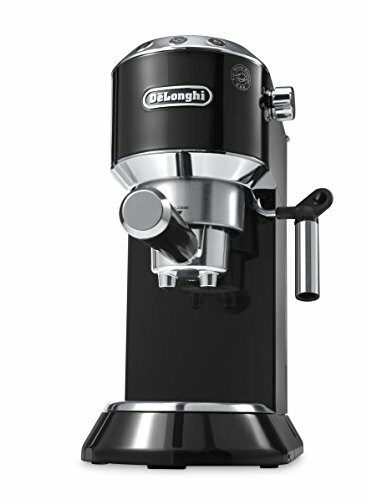 No mention of budget espresso machines without a mention of Delonghi! The Dedica is one of the company’s newer models, but it’s become quite popular the last couple of years due to its ultra slim countertop footprint. It’s the kind of espresso machine that you can easily persuade your girlfriend to get. The espresso and steaming also work pretty well. Honestly, you’re not going to win any barista competitions with this one, but it does the basics well. Did I mention that it’s cheap? Yes, that along with the appealing design are the main arguments for the Dedica.